However, there are often destinations, closer to home than we may think, that draw both travelers and locals alike. We had a recent experience of one such place while up in L.A. last week, when the spark of an idea led to a spontaneous visit to the Griffith Observatory. Located on the southern slope of Mount Hollywood just a few minutes off the freeway, Griffith Park, owned and operated by the City of Los Angeles, encompasses just over 3,000 acres. With natural wilderness areas and trails, the site is beautiful in itself, providing the perfect setting for the impressive Griffith Observatory. A project initially funded in 1912 with a generous gift from Griffith J. Griffith (who also donated the parklands), the goal was to provide the general public with opportunities to learn hands-on about astronomy and the physical sciences. Architects John C. Austin and Frederick M. Ashley oversaw the project, which included a team of the leading scientists and astronomers and featured the Hall of Science- a series of exhibits and interactive displays, as well as an astronomical telescope, Foucault pendulum, and planetarium. The Observatory opened in May of 1935 and quickly became a public monument and celebrated regional institution. The original structure was constructed of thickened concrete walls to resist the effects of seismic activity, with an art deco aesthetic, incorporating custom decorative finishes and architectural detailing. Several decades later, in 1960, the Observatory underwent an extensive modernization project, followed by a major expansion in the 2002, which included interior and exterior improvements, an additional 40,000 square feet of public space, a new theater and classroom, and an expanded series of exhibits, developed in conjunction with updated program offerings which highlight the history as well as the latest technology in astronomical exploration. 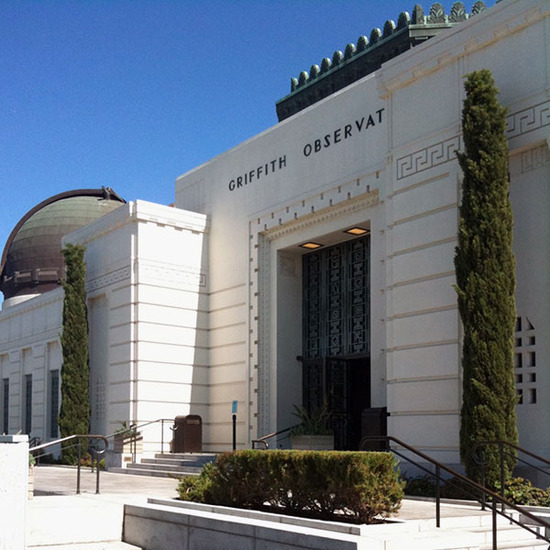 For more information on the renovation and expansion, visit the Griffith Observatory website. With scenic vistas of Los Angeles, a rich history, and innovative educational offerings in the context of a beautiful location, the Griffith Observatory receives over two million visitors each year, including thousands of students. Open Wednesday through Sunday until 10:00 p.m., the site is accessible by car and via public transit on weekends; further information on planning a visit can be found here. Also, stop by the official website for the latest programs and events. Whether you are traveling from afar or simply looking to enjoy an afternoon somewhere new, it's well worth a trip to this historic and engaging public park and observatory... Enjoy!